Mind on Movies is very excited to announce that have an exclusive with Fathom Events to giveaway passes to the new film RESIDENT EVIL: VENDETTA at Regal Winter Park Stadium 20 - 510 N Orlando Ave, Winter Park, FL 32789 on Monday, June 19th, 2017. 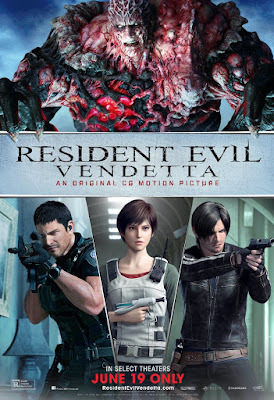 RESIDENT EVIL: VENDETTA is the third installment in the massively popular CG animated film franchise, following Resident Evil: Degeneration (2008) and Resident Evil: Damnation (2012). This not-to-be-missed event includes an exclusive introduction from the cast and behind-the-scenes footage. Derived from Capcom’s Resident Evil™, one of the bestselling video game franchises of all time (72 million + copies sold), RESIDENT EVIL: VENDETTA features the fan-favorite characters Leon S. Kennedy (Matt Mercer), Chris Redfield (Kevin Dorman) and Rebecca Chambers (Erin Cahill). The film is produced by Marza Animation Planet (Space Pirate Captain Harlock), executive produced by Takashi Shimizu (The Grudge), written by Makoto Fukami (Psycho Pass), and directed by Takanori Tsujimoto (Bushido Man). RESIDENT EVIL: VENDETTA is in Theaters on June 19th, 2017. Like Mind on Movies Facebook/Follow on Twitter. NO PURCHASE NECESSARY. Limit one (1) admit-two pass per person. This film is rated R. Must be 13 years of age or older to win passes. Employees of all promotional partners and their agencies are not eligible. Void where prohibited. Entries must be received by 6/15 to be eligible to receive pass. Winners will be contacted via e-mail to receive their pass. Sponsors not responsible for incomplete, lost, late or misdirected entries or for failure to receive entries due to transmission or technical failures of any kind. SEATING IS LIMITED, SO ARRIVE EARLY. PASS DOES NOT GUARANTEE A SEAT AT THE SCREENING. Refer to screening pass for further restrictions. ONE ENTRY PER PERSON. CLICK HERE to join our Mind on Movies Florida Email List.